Chaos Created is thrilled to have been featured by digital skills and careers magazine, Techmix. We were featured in the third issue of the publication, as part of a feature they ran on how coding is being taught in schools. Over the past year, in addition to our client-based work and in-house projects, we’ve been heavily involved with TeenTech events throughout the UK, talking about app development, and work-shopping ideas with around 300 teenagers per day. We’ve also been working with schools, running technical workshops and running Create An App in a Day type events for UK primary schools. You can read more about these workshops at http://code.chaoscreated.com. 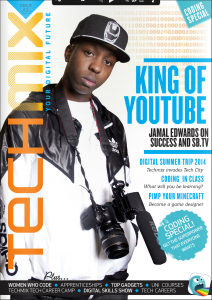 The article they wrote on our coding workshops is below, and you can read the whole article, online, at http://techmixmag.com. 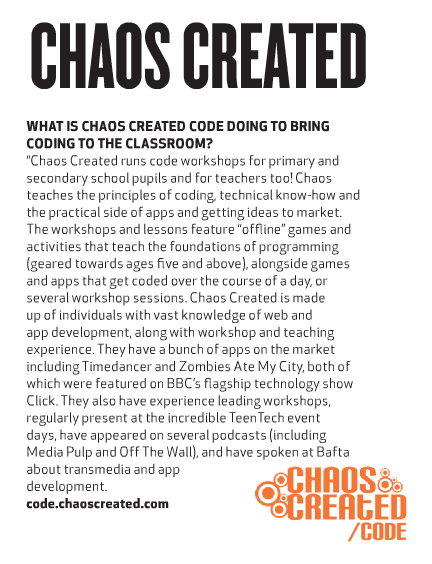 For more information about our coding workshops, check out http://code.chaoscreated.com.